Even as sale offers populate like Monster Dough in a fridge, it's time to assess how I did on the clothes and accessories budget in 2011. I track every cent spent on clothing and accessories, and evaluate it yearly. 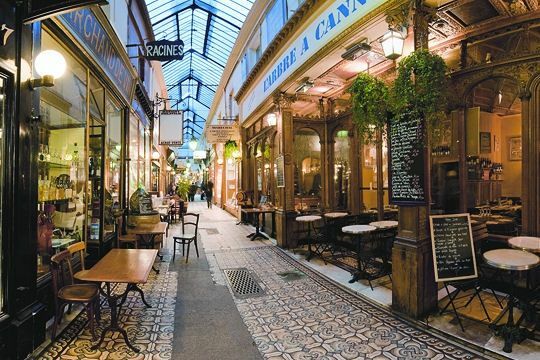 For 2011, I came in at budget, including a spree in Paris. My self-set budget is kind of like Weight Watchers points: I always want more, but if I were super-disciplined I'd manage with less. Finally, I slew the Sale Dragon, but I did follow Frugal Scholar's advice (for groceries, but you can apply it to clothes, too). I stockpiled sale-priced black jeans (worn almost every day from Oct. through April) from Talbots and department stores. Did I buy "fewer, yet finer" as I vowed at the end of '11? Yes, and at the same time realized, not without a pang, that I no longer need a power suit, an evening dress or even a dressy coat. Busted myself down to a minus because I didn't save a penny. I ruthlessly assess the ROI for every purchase. But, you've got to relax, sometimes, unless you want a wardrobe exclusively populated by sedate neutrals. Eric Bompard's Oleander pink cashmere cardi is worth every penny when days turn dark by 4:30 p.m., as is a less-costly black turtleneck from Lands' End. Clinkers: Mauve mod-print summer skirt, bought on sale, goes with little. Sandals that turned out to rub after awhile. Marimekko summer dress that might step up to the plate next spring. For 2012, I want that A! After three years of tracking and analysis, I hope I've learned something. I'd live with one mistake; perfection is a grim taskmaster. 1. Buy a dressy item that's perfect and a good buy when you see it, so you don't panic when an occasion arises and then spend way too much. 2. There's always a sale on jeans somewhere. Like cameras, you don't need this month's new model, and manufacturers discount last season's stock. 3. Drycleaning: evil hidden expense! These pricey pants, left, (from the boutique Motion, in Toronto) redeemed themselves: washable, no-iron, three-season. They alone saved at least $75 in cleaning bills. 4. To max value, the "'uniform'" approach (described in my "Simple Isn't Easy" post) cuts costs by at least 50%, once you get the uniform in hand. Not to mention doubles your closet space. I haven't yet achieved that dream, simple, edited wardrobe. But I have disarmed the "I Like It, I'll Make It Work Somehow" trap. Onward, to a new year! That's excellent that you track it all with such vigilance, I'm terrible with figures, even with a calculator in hand I can barely add up. My splurge budget is very small, and whilst I would like loads of new things for spring I believe a new dinner service is calling to me with the lure of a siren. Duchesse, I try to make purchases count more too, following your example. Last winter you introduced me to Eric Bompard and the black V-neck cardigan purchased there has been perfect. Next year at their sale maybe I will find a pink one like yours. I just splurged on a Liberty pink dressing gown at the Brora sale and am excited to receive it. My other splurge was a navy silk Elizabeth McKay dress with a ruffle around the neck and long sleeves. The proof will be how much these things are actually worn. You are so right about trying to buy fewer but better things. I admire your discipline! In the past, I have been terrible at keeping to a budget and have ended up with a closet stuffed full of things I don't wear. Since I have started thinking more carefully about my personal style, I have been getting better with choosing clothes that I will really wear. Good for you! In trying to wear more color this year, I've learned to "experiment" with inexpensive pieces, like cotton cardigans (on sale from Lands End and J.Crew). There were a few clunkers in there, but at $20 or less, I can chalk up to experience after trying a couple of times, then place in the donation pile. Tabitha: You could do it if you felt it served you. My budget is for my personal expenses only; house purchases come from a separate kitty. Francie: Good for you! Just ordered sweaters from the Bompard and Brora sales too, and also wear theirs I've had well over a decade. Louise: Suggest you read that "Simple Isn't Easy" post and see if you like the philosophy. A good trick is to turn the hanger of the clothes you wear the opposite way and after a month you will see what you do wear. Then sell or donate what you don't wear. pseu: Sounds like a kind of "drape yourself with the new colour" experiment, and important to get rid of the clinkers. Looking forward to the post. I wear colour on the top half only, these days. This year I have started listing every purchase I make. It will be interesting to check at end of year. I have tendency to try to forget how much I spend. So far I classic navy coat bought in sale plus pr of hard wearing boots which I have worn nearly every day so far. I have learned to buy clothes for the life I actually have. I too, need almost no dressy clothing. been a great help in making my wardrobe more cohesive. I'm also going to trust my gut feeling about an item as I find that something that gives me butterflies in my stomach is my style rather than a basic that the "experts" say should be in every women's wardrobe. I'll trust my instincts more often. Lynda343 Duchesse, do know when Eric Bompard will have their cashmere sweaters on sale this year. Very impressive! Could you list your--say--5 best purchases? i find it hard to anticipate what i will wear a lot--easy enough to talk about cost-per-wear when buying, but i am often surprised by what ends up being the best "investment." 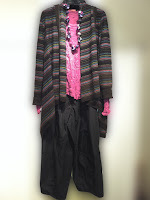 Lynda: Bompard's sale is on NOW, as are Brora and Pure's. (IMO Brora and EB best.) Good idea to create an account on their sites b/c then they will send you sale alerts. chicatanyage: Worn nearly every day is bound to be good value! A good coat is a great joy. kathy peck: But then, a wedding rears its head! I dislike shopping when I *have* to buy something so try to have a few dressy-enough things. Anonymous @ 9:42: I'm going to sound weird, but you asked. I not only carry a list in my bag of things I need or must replace, I have a Do Not Buy list. Otherwise, it would be one black skirt after another, or other duplicates. You would think I'd remember this when I am in a store, but I don't! When trying on, I always ask myself, "Where am I when I'm wearing this?" You sound like you have things well in hand! 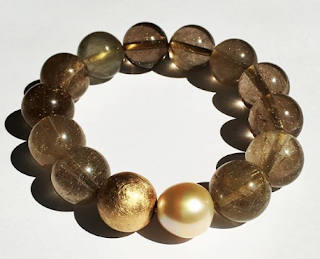 emma: I include jewelry too and colour-code purchases that so I can quickly add it in its own sub-category. I also colour-code replacement items and gifts. (What did I do b/f Excel?) This year's jewelry expense was low, thanks to gifts. frugal: Hmm, there's "best" and then there's "most-enjoyed"and sometimes it's hard to differentiate. #1 to #3: Three cashmere sweaters, b/c in Montreal wear them from Oct.- May, even summer in country. Brora, Bompard, Land's End. #4: A three-Tahitian-pearl pendant; goes with everything, stunning pearls! #5.: Wolff & Descourtis fine wool shawl bought in Paris, light, colourful. I prefer shawls to jackets most of the time. Black oxfords- but did have to take them to shoe repair to have one stretched to fit right. I save my receipts in the event that some garment may prove to be defective but I have never thought to add the totals up. I am very frugal now and consider each purchase. Gone are the days os spontaneous buying. Cashmere sweaters make me feel dressed up everyday! I have never needed or worn a power suit. But I do own 6 LBD's! All hail the uniform! If I tracked my purchases I'd cry, not that they are so many, just I hate precision. So I work it from the other end, how much I have to play with, then I do it. 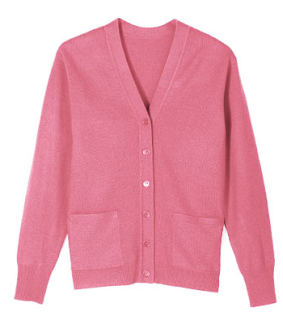 Oh, and I too am dreaming of pink cardigans, even though I own one already. I think they summon the spirits of summer. I've tracked expenses for a few years, which I hate by the way, because I was anticipating/planning for a move. Inspired by your post last January, I kept a budget this year and actually stuck with it in terms of actual expenses. I too would give myself an A- in that regard because I did not come in enough under budget to count. Value is another thing, although mostly I did really well with the bigger purchases, even a few statement pieces, managing to work them into my wardrobe in surprisingly varied ways. Where I fell short was in trying to fill specific gaps, or replacing things that were no longer the right size. Some of my experiments worked, many did not, and I need to pay more attention to what works for me and why in the future. I'm looking at pink for spring. There are a lot of good pinks and greens for me this spring and I will need some lighter weight clothes for the longer warm seasons. I want to stick to a budget and proceed with some caution as I suss out my new environs. I don't really need suits or evening clothes, but my style here is already a little more "dressed" than in my previous abode. hostess: Not sure how one can be "very frugal" without knowing the actual amount, but guess it's like weight, when we're in trouble we just know it! But I also find it very useful to see exactly what I bought. LPC: You might just round the numbers if you hate precision :) Was quite surprised to see the actual figure after the first year... I had amnesia about certain things. Mardel: What is it about doing that, that you hate? For me it is useful data. The value assessment ins more subjective but I can see where my money is going, a key tactic for any kind of financial management. And now that I am earning far less (in semi-retirement), want to be smart about the money that has to last 30+ years, I hope. I think I am going to try your system. It's early in the year and I have bought no clothing or accessories so far this year. As we approach retirement, it makes sense to have a uniform and have fewer, but very nice things. 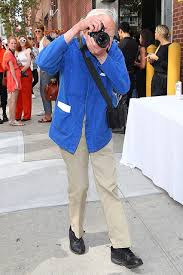 I have sort of started that with some very versatile Eileen Fisher items this fall and winter. Susan: Great start with your EF! Began this project after reading some financial planning article. Since I wanted to reduce my spending, and had that closet-stuffed-but-nothing-to-wear problem, figured I could make better choices. I suppose what I hated was seeing what things actually added up to. I have always been kind of laid back about spending in that first I pay obligations, then put a prescribed amount aside, then whatever is left is free to do with what I wish. Actually accounting for all of it was a shocker. But we too are retired, and I want to live on less, so it has proven helpful and shown me that there is lots of room for doing with less. I really don't want all that stuff, and last year I was on budget, but still spent too much on things that just got tossed. Granted they were inexpensive things, but the total added up to far too much. I want to eliminate that kind of waste. I think your idea of carrying a list of what not to buy is brilliant and I shall copy you on that because without guidance I tend to buy the same things over and over. Faced with a store full of merchandise I forget what is waiting patiently at home. Lynda: Sorry to say, Eric Bompard's online sale ended Jan. 8, but go to site and register anyway as they have sometimes had a second one just before the spring/summer line comes out. Wow, you ARE disciplined! I've always spent so little on my clothes (my wedding dress cost $7--really)that a budget seemed superfluous; my task recently has been to convince myself that I can actually afford some splurges. I'm still devoted to thrift shops (being small helps--I get other people's high-quality hand-me-downs) but this year I lost a bit of weight and bought 2 pairs of expensive new jeans (OK, on sale, but still...) which I wear, uniform style, with cashmere sweaters (I have lots of these, and wear them all) every day and feel great. I, too, would like to join the pretty pink sweater brigade, preferably in palest ballet pink or deep raspberry. Your cardigan is a particularly beautiful shade. C.: Used to spend quite a bit for work wardrobe, seemed to matter, and I enjoyed it, mostly. Eventually, suspected I was consuming from habit; wanted to be more conscious. Your uniform is mine, too. As your opposite, tall and large, I adore thrifts but only rarely find something. If a woman feels great in her jeans they are the right price! I had too much; the move pared me and now must exert real intent to not build back up. Lynda! Wait! Another correction: The Eri Bompard VIP sale ended Sunday but the open to all online sale starts now, Tuesday evening 7 pm EST. We are five years away from retirement and I still have specific needs for clothing. I'm trying hard to meet them in a high quality but still frugal way. We have that odd black tie event (some times spur of the moment) and conferences with evening events where I need to look sophisticated and well dressed. I have some standbys which have stood me in good stead. I like what someone said about learning to buy clothing for your own life. In years past, I've had some dressy casual items that just were not worn often enough. I don't need to dress up every day. What I really need is versatility and I'm learning how to achieve it. I totally forgot the dry cleaning budget when I tallied up my end of year expenses! Oops. Had to laugh at the "Do Not Buy" list...just what I need! I recently went through my closet in detail after losing quite a bit of weight, plus I was deciding which of my late mother's things I wanted to keep. Realized I have eight, yes eight, black cardigans. All somewhat different of course! Plus I live in a warm climate with little need of sweaters. Clearly there is a lot of paring down to do. The one thing I do really need (not black cardigans) is pants. Can anyone recommend a designer or style of pants that would look good on a tallish person with an apple shape; fairly large tummy but smaller hips & thighs? I probably wear a 10 in the hips but a 12 or even 14 in the waist. If the pants fit in the waist they tend to look like clown pants down below, unless they are exceptionally slim cut in the legs. I think I've figured out my uniform, finally, as the result of having to fit a long-lasting wardrobe into two suitcases! On the bottom, dark, flat-front trousers/jeans/cords or a pencil skirt; on the top, a light-weight cardi or pullover -- or a knit top, if it's warmeer. I own exactly one collared blouse -- a white one from Lands End that fits like it was made only for me. I bought a bunch of clothes in late summer, (rightly) reasoning that I wasn't going to want to buy anything in Spain except accessories. My two "think out of the box" purchases were a black/honey/cream tweed skirt and a camel cardigan. I look pretty darn elegant in them, if I do say so! Susan: "Versatility" says it all, to me. Terri: Big hidden expense! Once had a washable Agnes b. suit and wondered why can't all suits be like that? Now, rarely dryclean anything other than woolen winter coat or jacket. JillAnn: My first thought is that you need a tailor to fit your pants to your figure. A straight leg looks good on everyone; avoid a cut that narrows b/t thigh and ankle. As a woman with a tummy too, I forgo pleats and sew (side) pockets shut. (No pockets look best, hard to find.) 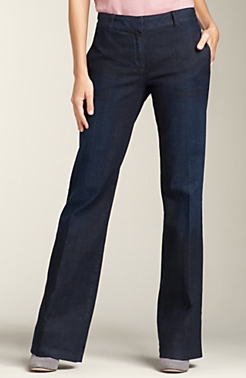 You can also wear bootcut or wider legs, which also balance the pear. Rubi: Travel is the perfect occasion for deducing the 'uniform'! I admire the discipline. I thought I had it at the beginning of last year, but it seemed to slip away about halfway through. Sometimes, it's simply a question of stepping into the wrong shop when I'm in a mood for a little pick-me-up. . . better than turning to drink? hmmmm. I do know that my closet is full enough and disorganized enough that I forget items I still like. Probably time for an intervention! Thanks for the inspiration, at least. I, too, only wear color on top and have a sea of black skirts and pants so they are on my "do not buy" list as well. On the other hand, I've had others mention color mixed with black is not very stylish. What do you think of that? materfamilias: For decades I was in the Ignorance is Bliss cohort, and blissful indeed. But I was out of whack... not in debt, just mindlessly spending and way too much stuff I didn't wear. You will know, for yourself, how much tracking makes sense! There are still times when I go, to hell with it, I want a new scarf- and indulge. A bit more saturation helps a colour "stand up" to the black. Black with white is classically chic, and the neutrals (navy, grey, cream, taupe and dark brown) are couture favourites. If you can wear the mid-saturated greens and blues (e.g., leaf, chartreuse, turquoise, Nile green, and their corresponding intensities in blues), you will see these look stylish. I find the jewel tones, such as Kelly green or magenta can look harsh on mature women. As for the reds, there is a red or pink for every woman, and it's fun to find yours. Sometimes you need a third colour. For example, I rarely wear red with black unless I add some grey or cream. If you wear scarves or jewelry you will find they bridge black with colour very well. I also like a rich taupe on the bottom but it is hard to find. I'll be posting more on black-on-the-bottom next week. I'm a mostly silent reader for a longtime and want to say, that your posts helped me through the year. After having fully transitioned to gray hair, most stuff in my closet felt wrong. Although I don't have an ample budget for shopping, I made "tabula rasa" and kept only a few clothes I could identify with. As a semi retired, it wasn't such a big deal. I bought less, read your blog, and others, and learned a lot. I wear cashmere sweaters, pants and boots for about six month of the year. I'm greatful you introduced me to Eric Bompard, because of the excellent quality and superb colors. Right now I ordered from their Sale once again(amongst others the same cardi like yours). Unfortunately the Kilimandscharo Tee was sold out. On the topic Pants: Cambio offers a great selection and colors, even a rich taupe. The fabric comes from Italy and it's produced it Bavaria. Maybe a bit pricey, but worth each buck! Duchesse, thanks again for writing such an ingenious, witty and coevally pragmatical blog. I spent about $5,000 in 2011, the most I've ever spent in one year in my entire life, but I needed to catch up after years of letting things go, so I'm ok with it. I embrace the uniform concept and loved read that book Simple Isn't Easy. Blimey, you are tough on yourself! I'm selling things online at the moment and I don't mind that I've got some clothes that I never should have bought. I expect to kiss a few frogs and find some unexpected princes in my clothes. PS - more blog posts please? I love reading what you have to say. barbara: When a reader like you comments, that's a gift! Funny you mentioned Cambio, almost mentioned them in my reply to Jill Ann about pants! Very beautifully-cut. Am truly happy that you find the posts useful. Susan Tiner: Some years require more spending, if one can- changes to lifestyle, moves (different climate), special occasions or weight change can all mean extra expense. Maybe they should reprint "Simple Isn't Easy". EleanorJane: Hope you are successful. Sold some designer labels online, but most of the "semi-designer" did better at consignment shops. I'm touched that you'd like more posts. For the moment, though, I want a life offline, too, so will keep this schedule. And if moved to do so, I'll occasionally post an extra. Re person in search of pants for apple (Jill Ann)--Both Eileen Fisher and Chicos make pants for women with weight around the middle. I stocked up on chico's ponte last year and bought some of the E Fisher crepe with wide elastic waistbands (she still makes these--washable crepe) a few years ago. That's all I wear, besides my skinny jeans. Also try Not Your Daughter's Jeans (company was sold, so may not have the same fit this year). Canadian buyers beware! The cost of my Bompard cardigan has DOUBLED, courtesy of our governments' and Canada Post's combined greed. Shipping costs(which I thought I'd already paid), duties, brokerage fees, taxes upon more taxes...and I'm not even counting the 2.5% premium my credit card company will add to my bill. I love the cardigan - but I'm sorry to say that it will never have any brothers or sisters. Bompard does charge shipping, and you will see that clearly indicated when you order. However, you are exempt from France's value-added tax (VAT), so you save 19.6% right there. To import your order, the Canadian govt adds taxes and duty, and a handling fee, usually $5 per order. By my calculation this does not "double the price" (given that you are exempt from VAT) but I often wait for a sale, saving, typically, 20-30%. Here's the weird thing: sometimes my order arrives in the mail with *no duty*, and sometimes it doesn't. Go figure and I'm not asking. So I guess you are planning to buy Canadian cashmere? You will not find anything close to these styles or colours *produced* in Canada. If you buy your sweater at a store, and it was not made here, the taxes and duty are buried in the price tag. As for the 2.5% foreign exchange fee the card company adds to your bill, you might get a US$ credit card and use that (last time I checked, they did not levy such a fee). If you use your $CDN card to order from any retailer outside Canada or use the card while traveling outside the country, same fees are applied. The way I look at it is, that's the price of poker in this town.